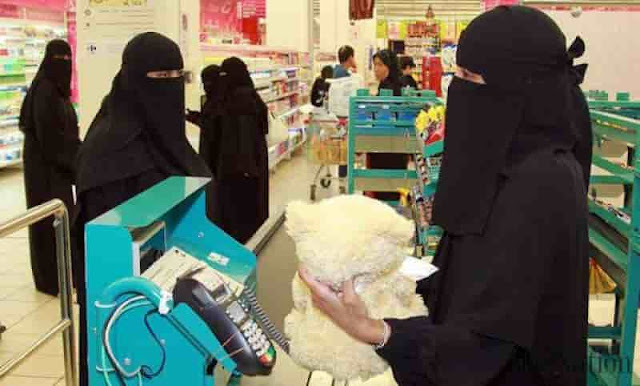 - Third phase covers shops like women's stuffs like perfumes, shoes, bags, socks, ready made clothing, kiosks, cosmetics, selling women's supplies and all other accessories related to women said Ministry of Labor's spokesperson to Saudi Press Agency. - Saudi Arabia aims to increase the proportion of women workforce from the current 23% to 28% by the year 2020 and to quadruple the number of females in senior civil service roles to 5%. - Saudi Arabia is aggressively promoting the 'Saudi First' policy in private companies and in public sector to overcome the unemployment rate of Saudi youth.